Pending budgetary approval, The Graduate School awards a limited number of fall Doctoral Dissertation Fellowships (DDF) to students in doctoral programs requiring a dissertation. Please note that fellowship funds are not guaranteed to any student who applies for the award. The fellowship is awarded in the amount of $2,000 to each eligible applicant. 1. Certify that he/she has never before been awarded the University of Connecticut Doctoral Dissertation Fellowship. 2. Certify that he/she will be enrolled for the fall 2019 semester at The Graduate School. 3. Certify that his/her total personal income will not exceed $40,000 during the twelve-month period of July 1, 2019 to June 30, 2020. 4. Document satisfactory completion and approval of the General Examination prior to midnight on May 31, 2019. 5. Document satisfactory completion and submission of the Dissertation Proposal, including full and current IRB or IACUC approval, prior to midnight on May 31, 2019. Applications will be accepted from Wednesday, May 1, 2019 until Friday, May 31, 2019. Applications received prior to May 1, 2019 or after May 31, 2019 will not be considered. To apply please fill out the online application form by going to https://grad.uconn.edu then click on Financing. In the drop down click on Fellowships and Awards. Notifications will be e-mailed to each applicant by the end of June 2019. This fellowship can only be awarded to an individual once. Doctoral students based at UConn Health and UConn Law School are not eligible to apply. This position offers a two-year Post-Doctoral Fellowship to individuals seeking both collaborative and independent research opportunities in the Early Developmental Laboratory of Ann Mastergeorge focusing on birth to five and early prevention and early intervention. Research expertise in some of the following areas is expected: early developmental trajectories and mediators/moderators of child outcomes; early prevention and early intervention in areas of health disparities such as poverty, developmental delays (including autism) and prematurity; use of eye-tracking and/or robotics to study eye-gaze and joint attention behaviors; parent-child interactions and synchrony. Education: Candidates must have completed their doctoral degree in human development, psychology, education (developmental focus) or a related field by September 1, 2019. Experience: Candidates should have expertise in early development, prevention and early intervention, strong analytic skills for longitudinal research designs and experience utilizing secondary data sets. Must have record of high-quality publications and evidence of grant collaborations and/or submissions. Texas Tech University is one of the state’s major universities consisting of 10 colleges, the Graduate School, and the School of Law. Located on an adjacent campus, the Texas Tech Health Sciences Center includes the Schools of Medicine, Pharmacy, Nursing, and Allied Health. The Center for Biotechnology and Genomics http://www.depts.ttu.edu/biotechnologyandgenomics/ offers instrumentation, support, and training in various aspects of modern biotechnology, including nextgen sequencing, bioinformatics, and functional genomics—and the Texas Tech Neuroimaging Institute (TTNI) http://www.depts.ttu.edu/vpr/ttni/ are pivotal university resources. Texas Tech is designated as a Carnegie Research 1 Institution Texas Tech and is also recognized as a Hispanic Serving Institution (HSI). Texas Tech is located in the West Texas High Plains city of Lubbock (population over 250,000) and has excellent medical facilities, a low cost of living, and a semi-arid, sunny, and mild climate. Lubbock is within driving distance of Dallas, Austin, Santa Fe and other major metropolitan cities. The Department of Human Development and Family Studies is an interdisciplinary research department with strong graduate and undergraduate programs focused on individual development across the life course, family structure, and family dynamics. The Department is a unit of the College of Human Sciences and is one of the largest units on the Texas Tech campus. It serves approximately 1,100 undergraduate and graduate students and offers master’s and doctoral degrees. Texas Tech University hosts several institutes, centers, and programs that may enhance candidate’s research productivity, including Early Head Start, the Center for the Study of Addiction and Recovery, the Institute for Measurement, Methodology, Analysis & Policy (IMMAP), and the Burkhart Center for Autism Education and Research. The HDFS department has three designated Centers including the Child Development Research Center (http://www.depts.ttu.edu/hs/cdrc/ ), the Early Head Start Center (http://www.depts.ttu.edu/hs/hdfs/earlyheadstart/ ), and the Center for Adolescent Resiliency (https://www.depts.ttu.edu/hs/car/). The Department of Human Development & Family Studies has an Institute for Developmental Science with several initiatives related to risk prevention and intervention in early childhood, risk and resilience in adolescence and socioeconomic, racial and ethnic disparities. The Iva Lea Barton Research Suite provides state of the art research facilities including research laboratories with observation rooms, a large conference room with videoconferencing capabilities as well as interview/meeting spaces within the research suite. Questions about this position should be directed to Ann M. Mastergeorge, Ph.D. ann.mastergeorge@ttu.edu. If you need assistance with the application process, contact Human Resources, Talent Acquisition at hrs.recruiting@ttu.edu or 806-742-3851. The VA Portland Health Care System (VAPORHCS) is recruiting for an Associate Chief of Staff for Research & Development (ACOS/R&D). VAPORHCS is a large tertiary care (1A) facility affiliated with Oregon Health & Science University (OHSU). VAPORHCS currently has over 100 investigators, more than 500 active protocols and 675 employees. In fiscal year 2018, VAPORHCS scientists were successful in competing for over $32 million in research grants from the VA, NIH, DOD and other sources. The VAPORHCS ranks 7th among all VAs nationwide in total research funding. There are 10 career development award or K-award recipients currently being trained at the VAPORHCS and 7 VA Research Career Scientists maintain large research programs here. Research is conducted in a total of 96,000 square feet of wet and dry lab space that supports programs in basic science, clinical research, rehabilitation, health services, cooperative studies, epidemiology and outcomes research. VAPORHCS is home to Centers of Excellence funded by the VA in Auditory Research and Health Services Research, and an NIH-funded Alcohol Research Center. Clinical programs awarded to the VAPORHCS include a NODES, NAVIGATE, MVP recruiting site, MIRECC, PADRECC, Centers for Multiple Sclerosis and Epilepsy, and Centers funded by QUERI and AHRQ. Research collaborations between the VAPORHCS and OHSU are greatly enhanced by a sky bridge that connects the VA with the university. The ideal candidate will have a record of accomplishment in peer-reviewed research activities and an interest in being a servant leader to the investigators, clinical service chiefs, COS and leadership of the VAPORHCS. Maintaining some ongoing research activity is required and equipment, space and other support will be provided for transitioning the applicant’s current research program. An appropriate academic appointment at OHSU will be requested. This is an ideal position for a physician-scientist interested in research administration who wishes to work with a professional staff renowned for their innovation, excellence and collegiality. Our setting in the beautiful Pacific Northwest and close partnership with OHSU further enhance this opportunity. Applicants must be an M.D., US citizens and board certified by their appropriate specialty board. Send a CV and cover letter to Joseph Quinn, M.D. (quinnj@ohsu.edu) by April 1, 2019. A relocation/recruitment incentive and permanent change of station relocation services are authorized for a highly qualified candidate. (3/13/2019) The Temple University Infant and Child Laboratory at Ambler is seeking a post-doctoral fellow who will be coordinating a project in collaboration with the Temple Department of Communication Sciences and Disorders, Maternity Care Coalition, Department of Pediatrics at Temple Health, University of Delaware, and Rutgers University-Camden. This project will involve 1) designing a Spanish version of our existing Duet early language intervention modules and 2) piloting the English and Spanish modules with families and their children under three in low-income households using a light-touch, remote delivery intervention model. The Memory Disorders Research Center at VA Boston Healthcare System is seeking a college graduate with background in cognitive psychology, cognitive neuroscience, or related field to serve as a full-time research assistant in our laboratory. Coursework in experimental design, statistics, memory and cognition desirable. Anticipated starting date is early summer 2019. Recruiting and scheduling research participants, including elderly individuals and patients with memory disorders. Administering and scoring neuropsychological tests. Maintaining and verifying the accuracy of databases. Performing administrative tasks related to laboratory management and human research compliance. Driving to testing sites (a valid drivers license is required). 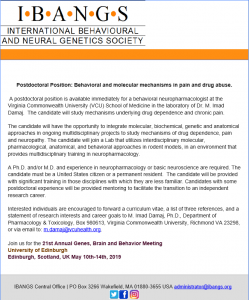 The position offers unique opportunities to become actively involved in cognitive neuroscience research and to be part of a lively and productive research group. The candidate must possess strong organizational and communication skills, and must be able to work independently and as part of a team. Prior independent research or clinical experience is highly recommended.A 2-year commitment is preferred. Interested candidates should send a letter of interest describing qualifications for the position, a transcript, and a resume to Dr. Mieke Verfaellie (verf@bu.edu). Three letters of recommendation should be sent directly to Dr. Verfaellie. (03/04/2019) Eastern Illionois University has openings for two full-time, non-tenure track instructors, beginning August 2019. The area for one position is open, while the other is restricted to clinical or related areas. The positions are renewable (potentially indefinitely) and individuals occupying these positions are well-placed to apply for a tenure-track line in their area when such lines become available. If you are interested please email jhmace@eiu.edu with a brief letter of application and CV; questions about the positions are welcome. (2/25/2019) SPIN is currently seeking applicants for a Postdoctoral Fellowship position, in partnership with Scleroderma Canada. Please read the job description below for details. Dr. Brett Thombs (www.thombsresearchteam.ca/) of McGill University and the Scleroderma Patient-centered Intervention Network (SPIN; www.spinsclero.com), in partnership with Scleroderma Canada (www.scleroderma.ca), is seeking a postdoctoral fellow for work in patient-engaged research. The fellowship includes training in the design and conduct of clinical trials via novel international trials of patient-centered interventions in a rare disease context. This is a two-year position supported by the Mitacs fellowship program (www.mitacs.ca/en). Scleroderma is a rare autoimmune connective tissue disease that causes significant disability and disfigurement. SPIN was created to bring together people living with scleroderma, health professionals, and scleroderma researchers from around the world to develop, test, and disseminate accessible support tools for people with scleroderma, including self-management, rehabilitation, psychological, and educational tools. Rare conditions like scleroderma are often under-studied, and patients usually have few or no tested treatment options, such as the kind of resources and support programs that are typically available to people with more common conditions. One reason for this is that the small number of patients with any given rare disease is a barrier to effectively developing, testing, and disseminating such programs. SPIN has addressed these barriers by (1) fostering a high level of patient engagement in all aspects of its research and program development; (2) leveraging the combined efforts of the international scleroderma community; (3) adapting well-tested patient support strategies from other chronic diseases to meet the needs of people with scleroderma and delivering them via the internet to increase accessibility; and (4) utilizing novel trial designs (e.g., cmRCT, partially nested designs) to conduct large, but efficient, trials in a resource-starved, but expensive, rare disease research and patient-care environment. SPIN is currently engaged in three trials, all funded by the Canadian Institutes of Health Research (CIHR). SPIN is seeking a postdoctoral fellow to coordinate a novel randomized controlled trial of the SPIN-SSLED Program, which is a videoconference-based training program for patient leaders of scleroderma support groups. The SPIN-SSLED Program aims to improve support group leader efficacy and, thus, to increase the effectiveness of existing support groups, reduce burden on support group leaders, and increase the availability of support groups. The postdoctoral fellow may also assist with the design and oversight of clinical trials for other interventions, including online programs that address body image concerns due to disease-related disfigurement, coping with emotional distress resulting from scleroderma, and physical activity support for scleroderma patients via the SPIN Cohort. Finally, the postdoctoral fellow will have the opportunity to engage in other patient-oriented research, such as research to support the development of tools to help people with scleroderma understand benefits and risks and to make difficult medical decisions. Trainees with Dr. Thombs take on significant responsibility and have published extensively (https://docs.wixstatic.com/ugd/7a652b_25db4233ae414f09b7c0016aa1397f80.pdf). The postdoctoral fellow will gain experience in the design and management of large international trials, data analysis, manuscript development (including first-authored publications), dissemination of results via national and international conferences, grant writing, and mentoring of students and staff. The postdoctoral fellow will have the opportunity to learn cutting-edge techniques for large-scale non-pharmacological trials. Dr. Thombs, along with SPIN Co-Director Dr. Linda Kwakkenbos, currently lead a CIHR-funded international team that is developing a CONSORT extension for reporting of clinical trials using cohorts and routinely-collected data. As a patient-centered initiative, SPIN collaborates closely with individuals with scleroderma and patient organizations through all stages of research. As such, the fellow will receive training in the areas of patient engagement and research designed in partnership with patients, which will directly impact support and quality of life outcomes for people with a devastating rare disease. Training Environment: SPIN is an international collaboration of over 150 members, including patients, patient organizations, researchers, and health care providers from 7 countries (Canada, USA, UK, France, Spain, Australia, Mexico) that is directed by Dr. Thombs. SPIN actively partners with > 20 Canadian and international patient organizations and maintains a cohort of > 1,800 patients from > 40 recruiting sites. The postdoctoral fellow will interact with SPIN’s international multidisciplinary team, which includes psychologists, rheumatologists, methodologists, and patient research partners from around the world. Dr. Thombs is affiliated with the McGill’s Departments of Psychiatry, Psychology, and Epidemiology, and the fellow will have the opportunity to participate in training activities, including seminars, in these departments and at the Jewish General Hospital. In the last 5 years, trainees under Dr. Thombs’ supervision have first-authored over 60 peer-reviewed articles and have co-authored articles more than 120 times. Eligibility: Applicants should have a recent doctoral degree in a health-related field, such as psychology, public health, or epidemiology. The doctoral degree should be obtained by the date of hire. Location: The postdoctoral fellow will work primarily at McGill University and the Jewish General Hospital in Montréal, Québec. Applications from candidates for distance/remote fellowships may also be considered in certain circumstances. Start Date: Start date is flexible, but candidate must be able to begin full-time work by September, 2019. 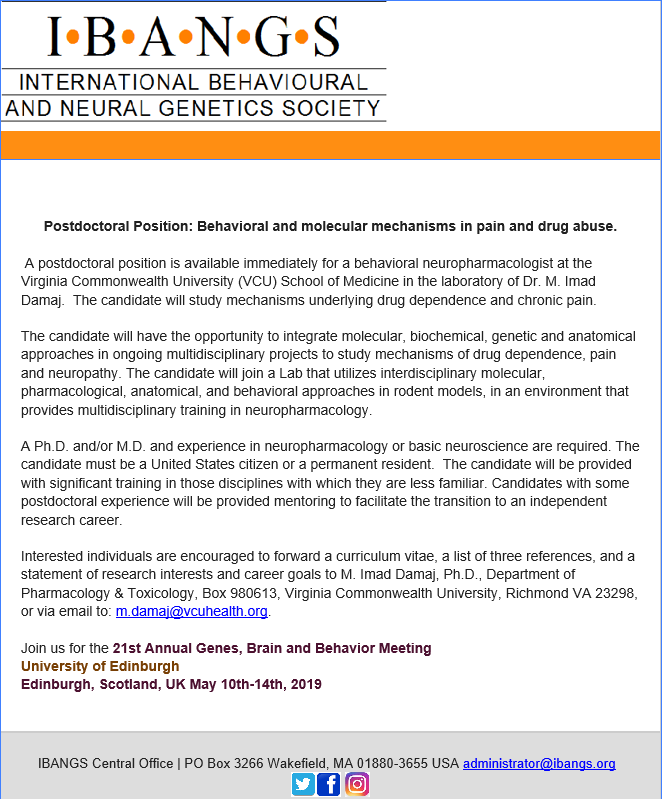 To apply: Applicants should send (1) a cover letter explaining their interest in the fellowship and how working in this position would support their career goals, (2) a curriculum vitae, (3) an unofficial transcript, (4) reprints or preprints of published articles or submitted manuscripts, and (5) contact information for three references to Ms. Claire Fedoruk (claire.fedoruk@gmail.com). Candidates who are selected for an interview will be contacted on a rolling basis until the position is filled. (2/21/2019) The Defense Health Operation of Leidos is currently looking for a Post-Doctoral Psychologist to support research studies and analyses to determine the biomedical response of humans to stressors identified in the special warfare, surface, undersea, diving, and submarine environments at the Naval Submarine Medical Research Laboratory (NSMRL) in Groton, CT. NSMRL conducts research and investigates the effects of medical, psychological, and performance issues associated with the health and performance of naval personnel in operational and non-operational settings. Research areas will include studies to evaluate multiple medical conditions affecting submarine qualifications and develop strategies to improve the mental health of submariners; the studies will assess and enhance the psychological screening of prospective war-fighters and test and evaluation of attrition risk. Identify Navy-relevant research topics in the areas of optimization of human performance, selection and classification, mental health interventions, or social/behavioral dynamics. Write research pre-proposals, research protocols, formal technical reports, and journal publications addressing the above topics. Support execution of approved work units/research projects by determining requirements, obtaining/developing and fabricating laboratory equipment and materials, develop and monitor progress and financial plans, develop documentation and coordinate approval of related Institutional Review Board documents, and manage resources necessary to meet project goals. Work with military and Government project managers to develop budgets against operational and research projects. Develop and evaluate appropriate methodologies, write standards of procedure to perform appropriate methodologies, and perform quality assurance checks to ensure that appropriate methodologies are followed consistently. Perform investigations, job analyses, and/or experiments. Develop novel personnel screening and selection tools. Develop mental well-being, stress, and/or psychological resilience programs. Obtain raw data and assemble analytic data sets, and gather test/survey/experiment results. Prepare summaries and publications for non-research technical and general audiences. Work is to be primarily performed on a government installation. The normal work week is Monday through Friday 0800 to 1630. Candidates must demonstrate a working knowledge of item development, scale development, factor analysis, and/or structural equation modeling (SEM). Candidates must demonstrate expert working knowledge in behavioral statistical software (i.e., R, SPSS, MATLAB). Candidates must display a willingness to be exposed to a broad research and management experience in the human performance domain. The candidate will be required to acquire, at a minimum, a SECRET classification access level. Preference will be given to a candidate who already has this clearance level. Due to Federal contract requirements, US citizenship is required. Demonstrate the ability to extend and apply the knowledge of research to the missions of the NSMRL Command and the Navy. Previous experience designing and/or implementing mental health interventions is preferred. Demonstrated evidence of scientific achievement in the human performance domain is preferred, as shown by the publication of articles and reports, membership in scientific societies, knowledge of and experience in writing and editing technical and scientific research information, as well as the ability to speak well and concisely, and confer with professional colleagues on a peer basis. Knowledge of research examining human performance in a submarine environment is preferred. (02/07/2019) We invite applications for a postdoctoral position in computational modeling of language at the University of Maryland, co-advised by Naomi Feldman and Jan Edwards. The starting date is flexible, but would ideally be in summer 2019. The postdoc will be part of an NIH-funded project, in collaboration with Pat Shafto at Rutgers University-Newark, that uses models of pedagogical reasoning to predict which language interventions will be most effective for helping children with Developmental Language Disorder learn grammatical morphemes. Experience with probabilistic models of language acquisition and interests in morphological processing and/or language disorders would be helpful, but anyone who is interested in the position is encouraged to apply. centers (http://languagescience.umd.edu ). The person hired for this position will have opportunities to interact regularly with colleagues from linguistics, hearing and speech, computer science, and other units on campus, and will be a member of the Computational Linguistics and Information Processing Lab (http://clip.umiacs.umd.edu).The PIs are committed to supporting the success of trainees who belong to groups that are underrepresented in academia and in computing. To apply, please send a CV, research statement, writing sample, and contact information for three references to nhf@umd.edu (letters are not needed as part of the initial application). Review of applications will begin February 22 and will continue until the position is filled. (1/11/2019) There is an opportunity for a Ph.D. behavioral neuroscientist to join the Jackson Laboratory team as Senior Manager of Neurobehavioral Phenotyping. (12/11/18) The Psychology Department at Eastern Illinois University has openings for two full-time (9-month) tenure-track faculty positions in (1) cognitive neuroscience and (2) biopsychology or behavioral neuroscience. Duties include teaching undergraduate courses in psychology (in areas of expertise, as well as areas of general need), maintaining an active research program, and participating in service to the department and university. Individuals should also demonstrate commitment to diversity and experience with promoting inclusive excellence. The anticipated start date is August 16, 2019. Individuals applying for the first position should hold a Ph.D. in cognitive neuroscience or a closely related area. Individuals applying for the second position should hold a Ph.D. in biopsychology, behavioral neuroscience, or closely related area. Candidates are expected to have a doctoral degree (Ph.D.) at the time of appointment. Other requirements include demonstrated evidence of teaching excellence at the college/university level and a commitment to research and scholarly activity. To apply, please submit the following: letter of application, vita, three confidential letters of reference, and available reprints. For position 1 (cognitive neuroscience), send application materials via Interfolio at https://apply.interfolio.com/54761. For position 2 (biopsychology/behavioral neuroscience), send application materials via Interfolio at https://apply.interfolio.com/54784. Review of applications will begin on January 7, 2019 and will continue until the positions are filled. For questions regarding this search, please contact Jeffrey Stowell, Screening Committee Chair, at jrstowell@eiu.edu. The Department of Psychology serves over 400 undergraduate and graduate students, having undergraduate programs in psychology (BA) and neuroscience (BS), as well as graduate programs in clinical psychology (MA) and school psychology (MA, SSP). The Department also has an undergraduate honors program, and serves approximately 200 minors in psychology and neuroscience. Eastern Illinois University is an Affirmative Action/Equal Opportunity Employer – minority/female/disability/veteran – committed to achieving a diverse community. (12/6/2018) Empower every person and organization on the planet to achieve more. That’s what inspires us, drives our work, and pushes us to challenge the status quo every day. At Microsoft, we also work to empower our employees, so they can achieve more. We believe we should each find meaning in our work and we ensure employees have the freedom and the reach to help make a difference in the world. Microsoft Research provides a dynamic environment for research careers with a network of world-class research labs led by globally-recognized scientists and engineers. Our researchers and engineers pursue innovation in a range of scientific and technical disciplines to help solve complex challenges in diverse fields, including computing, healthcare, economics, and the environment. The Computational Social Science group at Microsoft Research NYC is actively seeking summer interns to join us in advancing the state-of-the-art in computational social science and online experimentation. The ideal applicant will possess awareness of the theoretical and experimental social science literature, experience with experimental design, as well as significant computer programming expertise. Microsoft Research offers an exhilarating and supportive environment for cutting-edge, multidisciplinary research with access to an extraordinary diversity of big and small data sources, ample budget for online experimentation, an open publications policy, and close links to top academic institutions around the world. We seek applicants with the passion and ability to craft and pursue an independent research program. Intern mentors in the Computational Social Science group in New York include the following researchers: Dan Goldstein, Shawndra Hill, Jake Hofman, David Rothschild, Hanna Wallach and Duncan Watts. We collaborate extensively with the other groups at MSR NYC (fairness/accountability/transparency/ethics in AI, computational economics, machine learning, and computer systems) and with groups across Microsoft Research. We are committed to building an inclusive, diverse and pluralistic research environment, and strongly encourage applications from women, minorities, individuals with disabilities, veterans, as well as students with non-traditional backgrounds. Students are paired with mentors and expected to collaborate with other interns and researchers, present findings, and contribute to the vibrant life of the research lab during their 12 week internship. • Must be currently enrolled in a PhD program in computer science, statistics, mathematics, or a related social science field. (11/30/2018) POSITION DESCRIPTION: The Department of Biological Sciences at the University of Texas at El Paso (UTEP) invites applications for a tenure-track assistant professor position for a Big Data/Computational Biologist. In particular, we are seeking highly collaborative candidates with expertise in analysis of omics, including but not limited to genomics, proteomics, or metabolomics; imaging or other large biological datasets. The anticipated appointment date is fall 2019 or earlier. The successful candidate is expected to (1) establish an extramurally funded research program; (2) teach and mentor undergraduate, masters, and doctoral students; and (3) have a strong potential for collaboration across biomedical sciences and ecology and evolutionary biology (EEB). (11/29/218) The Maryland Anxiety Center is seeking a clinician to join our team in the Greater Baltimore Area. The Maryland Anxiety Center is a growing private practice in Towson, Maryland specializing in the treatment of anxiety and obsessive-compulsive and related disorders. Clinicians at The Maryland Anxiety Center provide individual, group, in vivo and gold standard evidence-based CBT treatment protocols. We often incorporate other CBT based approaches such as ACT, MI, DBT, the UP and mindfulness techniques per individual need. Clinicians are provided referrals and work to build a caseload of 20-30 face-to-face hours per week. Sessions are conducted in the office, in public settings, and in patients’ homes, as required. cohesive. We regularly attend and/or present at annual professional conferences to stay current with the most effective state-of-the-art treatments. In addition to clinical work, clinicians have the opportunity to be involved in our novel and creative projects including specialized trainings, presentations, blogging, marketing, professional development and advocacy. clinician’s experience and expertise. Benefits include flexible schedules (based on patient availability) and discounted group health insurance. It is preferred that candidates be independently licensed in the state of Maryland (PsyD/PhD, LCPC, LCSW-C) with experience working with, or have a strong passion to work with, individuals struggling with anxiety and OCD-related disorders. Job-specific training will be provided. (11/26/18) Gan Ezra in Rockland County is seeking a dynamic, experienced Psychologist for maternity coverage and per diem evaluations. Must be NYS certified and SDOH approved. Certified Bilingual Yiddish a plus. We offer a competitive salary. If you want to be part of HASCs highly dedicated team of professionals, please send your resume to Cheryl.follman@hasc.net. We have begun a search for a tenure-track faculty position in L1 Acquisition at the Université du Québec à Montréal (UQAM). As a francophone university, the successful candidate will need to be able to teach in French. The position offers a competitive salary, benefits, a defined-benefits pension plan, and quick tenure (after only 4 years). UQAM is located in the heart of Montreal, a vibrant, multicultural, and very affordable city. For candidates with children, the province has a subsidized daycare system and the lowest university tuition costs in North America. (11/19/2018) The Kaczorowski Lab at The Jackson Laboratory is seeking Postdoctoral and Research Scientist Level personnel to investigate mechanisms underlying susceptibility and resilience to normal aging and Alzheimer’s disease (https://www.neuro-central.com/2018/09/19/risk-resilience-understanding-role-genetics-alzheimers-disease/). Dr. Kaczorowski is an Associate Professor and the Evnin Family Endowed Chair in Alzheimer’s Research at the Jackson Laboratory – a research institution specializing in genetics and genomics in order to discover solutions for disease. Projects leverage new translational mouse models, electrophysiology, circuit mapping and genome engineering to decipher how genetic and environmental factors interact to influence learning and memory abilities, cognitive aging, neurodegeneration, and Alzheimer’s. Sources of support include NIH, BrightFocus, The Glenn Foundation for Medical Research, as well as generous philanthropy awards in support of research and innovation in areas of normal aging and Alzhimer’s Disease. Exceptional candidates will have the opportunity to apply for the prestigious JAX Scholar award, which supports promising early-career postdoctoral associates conducting cutting edge biomedical and basic biological research at JAX. The award includes an independent research and travel budget and a salary above our standard postdoctoral scale (https://www.jax.org/education-and-learning/pre-and-postdoctoralprogram/jax-scholars ). Key Responsibilities: · The successful candidate will be encouraged to develop an independent research program using a broad array of resources and expertise available to the lab (https://www.jax.org/research-andfaculty/tools/scientific-research-services). Ability to work independently and in a team environment benefitting individual projects while supporting overall laboratory goals. (11/16/2018) The Maryland Anxiety Center is seeking a clinician to join our team in the Greater Baltimore Area. The Maryland Anxiety Center is a growing private practice in Towson, Maryland specializing in the treatment of anxiety and obsessive-compulsive and related disorders. Clinicians at The Maryland Anxiety Center provide individual, group, in vivo and gold standard evidence-based CBT treatment protocols. We often incorporate other CBT based approaches such as ACT, MI, DBT, the UP and mindfulness techniques per individual need. Clinicians are provided referrals and work to build a caseload of 20-30 face-to-face hours per week. Sessions are conducted in the office, in public settings, and in patients’ homes, as required. The environment at The Maryland Anxiety Center is didactic, collaborative and cohesive. We regularly attend and/or present at annual professional conferences to stay current with the most effective state-of-the-art treatments. In addition to clinical work, clinicians have the opportunity to be involved in our novel and creative projects including specialized trainings, presentations, blogging, marketing, professional development and advocacy. Employees earn a percentage of collected patient fees, which are based on the clinician’s experience and expertise. Benefits include flexible schedules (based on patient availability) and discounted group health insurance. It is preferred that candidates be independently licensed in the state of Maryland (PsyD/PhD, LCPC, LCSW-C) with experience working with, or have a strong passion to work with, individuals struggling with anxiety and OCD-related disorders. Job-specific training will be provided.